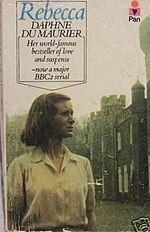 There are many editions of Rebecca by Daphne du Maurier, and many people have read it more than once! I first read it out of desperation when I had been away from school for weeks and someone had told me it was our class text. Needless to say, I devoured it; the tale of a nervous young woman suddenly whisked away to live in the splendour that was Manderley was irresistible. Then a mystery that excited the sympathies for a guilty party, all against the background of a Cornwall that I could only dream of from the frankly boring Midlands. Tales of shipwrecks, sea mists and not least grand parties had me hooked, along with the self conscious writing about the need to hold onto wonderful moments for when life returned to normal. It was, and is, a wonderful book. We read it as part of our Book group, and were amazed, looking back, at how much we had all enjoyed it. We realised that there were some very interesting themes to be considered; jealousy, the lack of confidence of the nameless heroine, the destruction and pain to be caused by Mrs Danvers and of course, the eponymous character of Rebecca herself. The characters themselves fascinated us, as we debated the character of the narrator herself, seen through the eyes of those around her. We even speculated which character we would most like to meet. I thought Beatrice at lest knew what was going on. Maxim was an enigma; marrying the complete opposite of his first wife on what seemed to be a whim, then almost leaving her to cope with the past instead of her own future. The greatest achievement, I think, is creating the sense of a thriller when the book’s opening chapter reveals so much of what eventually happens. I’m not surprised that there have been at least two well written ‘sequels’, by Sally Beauman and Susan Hill, as there are so many questions left to answer. It was with great expectations that we went to see Kneehigh Theatre’s production of Rebecca. It was an interesting version; the difficulties of staging a play so connected to a place were boldly tackled with a clever stage design inventively used by the talented cast. I’m not sure that the elements of comedy worked, and certainly the characters were not what I expected. The central, nameless role was well realised, and the music was haunting and scene enhancing. Some of the action was mystifying, and I’m not sure that some of it worked, but overall it tackled a complex book in an absorbing way, and the production presented varied entertainment at the very least! If you go on the company’s website you will get a flavour of it : http://www.kneehigh.co.uk. Overall, this is a classic book. If you have never read it, do track down a copy and sink in. If you read it ages ago, try a reread. You will find new things here!